Objective: In the last twenty five years or so, microprocessors and microelectronics in general have brought about a revolution in computer science, manufacturing, telecommunications as well as in space and high-energy physics. In view of the impact of this new technology .In recent years the Laboratory has organized and provided support not only to courses strictly related to Microprocessors, but also to other activities related to telematics, programming of real-time systems, data acquisition systems, digital signal processing and scientific instrumentation. Objective: The Signals and Systems is concerned with the representation of signals and the study of the changes that occur to them as they pass through systems. The study of Signals and Systems is to allow one to predict, with some certainty, the behaviour of systems when they are subjected to different input signals. Objective: Digital Signal Processing (DSP) can be described as the processing of signals using digital techniques or digital computers. A signal is a piece of information in binary or digital form. Digital Signal processing techniques improve signal quality or extract important information by removing unwanted part of the signal. 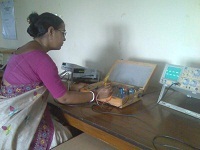 Objective: This lab is newly introduced in the curriculum of WBUT for the B.Tech students of ECE 2nd year 3rd semester. The purpose of this lab is to realize the characteristics of various semiconductor devices such as BJT, JFET, and RC coupled amplifiers etc. using breadboard and also using suitable software. Objective: All kind of signals we deal with in nature are analog. Analog Communication is an essential part of modern day technology. The course provides comprehensive, hands-on instruction in the terminology, principles, and applications of the analog communication circuits. Objective: Analog systems have been dominant over the last century. However, over the last two decades digital communications have become prominent because of the increase in performance it provides. Digital systems allow for increased data transmission and more resistance to noise. Objective: In this lab we study the latest communication techniques. The optical fiber communication technique is one of the developments in the field of communication where the information is transmitted from one place to another through optical fiber in the form of light defying the electromagnetic interference and increasing the bandwidth. Objective: There will be a couple of familiarization lectures before the practical classes are undertaken where basic concept of the Microwave Test-Bench will be given. Lectures on measurement techniques and error calculation will also have to be organized. Objective: This lab has been established to give idea to the students about the configuration and simulation of Very Large Scale Integrated Circuits & Systems. Basic Objectives of this lab to explore various design style of simple and complex Integrated Circuits(IC) near to students. Objective: Traditionally integrated circuits have been developed using schematics. With shrinking silicon structures and higher integration densities, automated tools for Electronic Design Automation (EDA) have been developed. Objective: The laboratory serve the students to impart their essential knowledge of electronic circuit design and fault analysis.This laboratory enhance hands on experience of the students to design different electrinic circuits with brade boards and with differnt active & passive components. Objective:This is a laboratory in which students are required to show their innovativeness and understanding of the subject through software based programming. The laboratory comprises of the application of four years of study of Electronics & Communication Engineering. Objective: This is an Advance communication Laboratory in which the PG students get to study the latest advances in communication like the advance modulation techniques like QPSK, MPSK, MSK, optical communication and study the different antennas used for he purpose of communication. All these techniques facilitate long distance communication. Objective: This is Communication System Laboratory in which the PG students get to study the latest advances in communication like optical communication and wireless communication. In optical fiber communication technique we study how light s to transmit information from one place to another through optical fiber using the principle of total internal reflection and minimising the losses and defying the electromagnetic interference. Objective: In the department we have dedicated servicing unit where servicing is done within our limitations.